Japan has long relied on fossil fuels and nuclear power as their primary energy sources but have recently been moving more towards renewables. 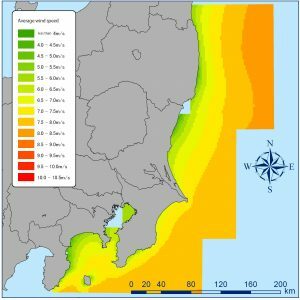 Japan has a significant amount of marine renewable energy potential considering their location as an island in the Pacific Ocean. The Kamisu wind farm was the first Japanese offshore wind farm and it paved the way for other offshore wind projects. The Kamisu nearshore wind farm is located roughly 50 meters off the southernmost edge of the city of Kamisu, Japan in the Kashima-Nada Sea. It consists of seven turbines, each producing 2 MW, to total an energy capacity of 14 MW (4C Offshore, 2010). A second wind farm made of 8 wind turbines was built up in the same area only three years later due to the success of the first set of turbines. The same model of turbines was used, allowing for an additional 16 MW to be produced at the Kamisu wind farm (4C Offshore, 2013). The local government chose a private, regional renewable energy company called Wind Power Ibaraki Ltd. to develop and maintain operation of the wind farm (JWPA, 2017). No information was found on the preliminary decisions regarding the project or finances, since many of the documents are in Japanese. However, according to METI estimates, development of a project of this size in 2013 would cost nearly 16 billion Japanese yen, with significant funding coming from the government (Carbon Trust, 2014). An EIA (Environmental Impact Assessment) Law was established in Japan in 1999 but did not cover wind energy projects until 2011 (Carbon Trust, 2014). The first phase of the Kamisu wind farm became operational in 2010 and the second phase was already in motion, therefore the Kamisu wind farm was not required to undergo an EIA. The major environmental impacts of offshore wind are generally noise pollution and EMFs (electro-magnetic fields) that may disturb marine organism behavior. Due to the close proximity to land, the impact of EMFs on marine life is reduced as compared to marine energy projects located further away. 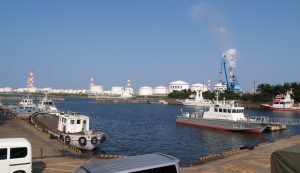 The Kashima port is also located nearby, with shipping vessels contributing to noise pollution. This fact may potentially cover up the operational noise of the wind turbines or just increase the overall noise pollution in the sea. No studies have been done to investigate this. The turbines use a monopole foundation driven into the seabed to keep them steady, which is especially necessary since Japan is prone to tsunamis. The turbines are in four meter deep water, slightly shallower than most offshore wind turbines. They have 60 meter tall towers, with 40 meter blades, totaling a 100 meter height- a pretty standard turbine size (4C Offshore, 2010, 2013). Wind speeds in the located area are about 7 meters per second, suitable for 0-10 MW turbines (JWPA, 2017). No documentation was found on the installation process for this project. The first seven turbines became operational in 2010, and the wind farm was extended in 2013. The project provides electricity to about 21,000 homes annually and has reduced carbon dioxide emissions by almost 43,000 tons each year (4C Offshore, 2010, 2013). While these numbers represent only a tiny fraction of Japan’s population and the world’s carbon emissions, it is still inspiring to see this progress. The wind farm survived the 2011 tsunami that led to the Fukushima nuclear power accident. No damage was found on the turbines but they were forced to stop generating power due to issues connecting to the grid. They became fully operational again in 3 days (JFS, 2011). After this incident, the Japanese public’s trust of nuclear power became shaky and the government has reduced its use of this energy source. Hopefully, this will motivate the public to push for renewable energy projects. The government has invested in many new offshore wind projects since the incident and in 2012, proposed construction of a larger wind farm offshore of Kamisu. This wind farm would consist of twenty 5 MW turbines, that would produce a total of 100 MW (JFS, 2012). 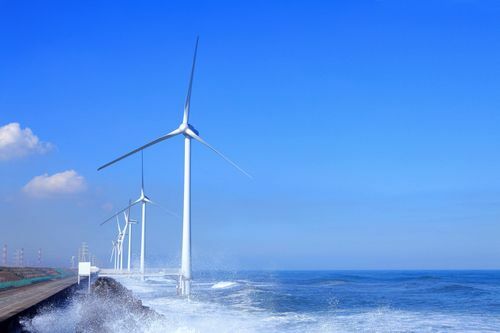 No recent news has been reported, suggesting that the project is still undergoing assessment and licensing but wind power companies have already been chosen to develop the project and investors have agreed to take part (ORIX, 2015). This is an exciting advancement in the field of renewable energy that provides hope for cleaner and safer energy sources. “Kamisu Nearshore Wind Farm – Phase 1 Offshore Wind Farm.” 4C Offshore Ltd, 4C Offshore Ltd, July 2010, www.4coffshore.com/windfarms/kamisu-nearshore-wind-farm—phase-1-japan-jp05.html. “Kamisu Nearshore Wind Farm – Phase 2 Offshore Wind Farm.” 4C Offshore Ltd, 4C Offshore Ltd, Mar. 2013, www.4coffshore.com/windfarms/kamisu-nearshore-wind-farm—phase-2-japan-jp17.html. “Major Japanese Wind Power Project Offshore from Port of Kashima Announced. JFS Japan for Sustainability.” JFS – Japan for Sustainability, Japan for Sustainability, Dec. 2012, www.japanfs.org/en/news/archives/news_id032418.html. Appraisal of the Offshore Wind Industry in Japan . Carbon Trust, British Embassy Tokyo, 2014, www.carbontrust.com/media/566323/ctc834-detailed-appraisal-of-the-offshore-wind-industry-in-japan.pdf. “Offshore Wind Farm Withstands Great East Japan Earthquake and Tsunami. JFS Japan for Sustainability.” JFS – Japan for Sustainability, JFS – Japan for Sustainability, July 2011, www.japanfs.org/en/news/archives/news_id031055.html. “ORIX Participates in the Development of Kashima Port Large-Scale Offshore Wind Farm.” ORIX | News Releases | 2015 | ORIX Participates in the Development of Kashima Port Large-Scale Offshore Wind Farm, ORIX, 2015, www.orix.co.jp/grp/en/news/2015/150528_ORIXE.html.